HIMARS is a highly-mobile artillery rocket system offering the firepower of MLRS on a wheeled chassis. HIMARS fires entire suite of MLRS munitions from RRPR to 300km ATACMS. 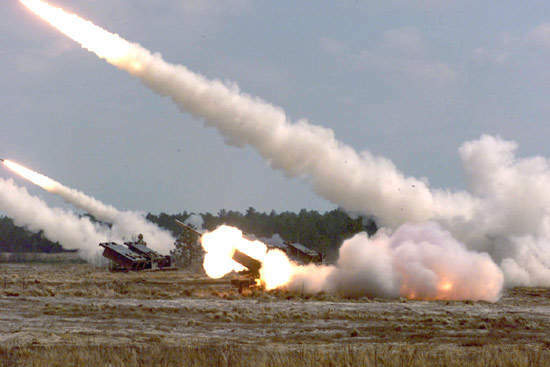 The high-mobility artillery rocket system (HIMARS) firing ATACMS missiles. 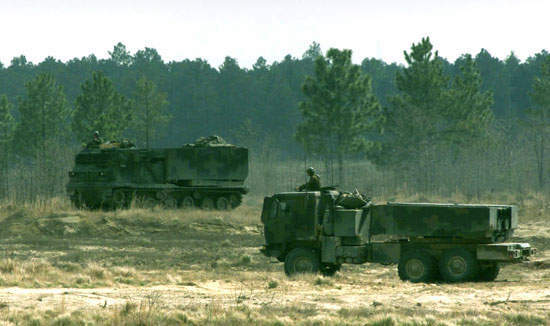 HIMARS entered service with the 27th Field Artillery, 18th Airborne Corps at Fort Bragg, North Carolina, in June 2005. HIMARS carries a single six-pack of rockets on the Army's family of medium tactical vehicles (FMTV) 6x6 all-wheel drive 5t truck by Armor Holdings (formerly Stewart and Stevenson). The HIMARS vehicle weighs 24,000lb, half as much as the MLRS. HIMARS can fire the range of MLRS rockets including the new GPS-guided extended range GMLRS. The improved fire control system (IFCS) upgrade for MLRS launchers will be standard equipment on production HIMARS vehicles. The high-mobility artillery rocket system (HIMARS) is the newest member of the multiple-launch rocket system (MLRS) family. HIMARS is a highly-mobile artillery rocket system offering the firepower of MLRS on a wheeled chassis. It was developed in 1996 by Lockheed Martin Missiles and Fire Control under an advanced concept technology demonstration (ACTD) programme. HIMARS is intended to engage and defeat artillery, air defence concentrations, trucks, and light armour and personnel carriers, as well as support troop and supply concentrations. The system launches its weapons and moves away from the area at high speed before enemy forces locate the launch site. In January 2000, Lockheed Martin was awarded an EMD (engineering and manufacturing development) contract to provide six HIMARS launchers. A further two HIMARS launchers were ordered under a two-year user evaluation programme for the US Marines Corps. 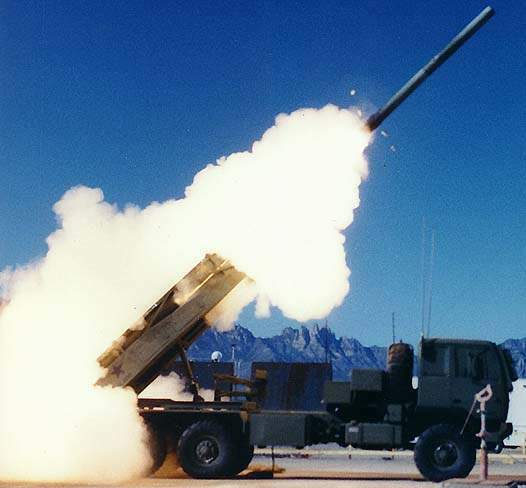 US Army and Marine Corps signed a contract in March 2003 for the low-rate initial production (LRIP) of 89 launchers for the Army and four for the USMC. In January 2004, a second LRIP contract was awarded in for 25 launchers for the army and one for the USMC. A third, consisting of 37 launchers for the army and one for the USMC, was awarded in January 2005 for. A total procurement of 900 launchers is planned. In November 2004, HIMARS successfully completed initial operational test and evaluation (IOT&E). Three prototype HIMARS launchers were successfully used in combat during Operation Iraqi Freedom. 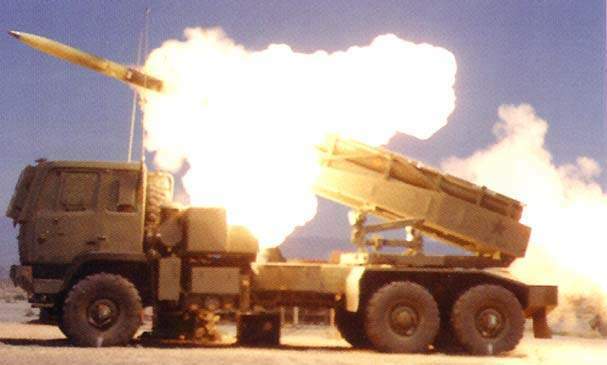 HIMARS entered service in June 2005 with the 27th Field Artillery, 18th Airborne Corps at Fort Bragg, North Carolina. The first full-rate production contract was awarded in December 2005. 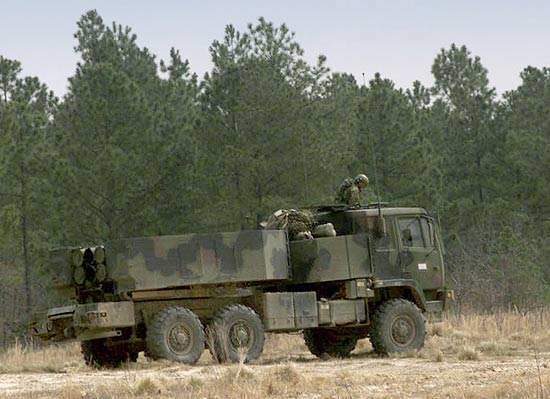 HIMARS is also in service with 1st Battalion, 181st Field Artillery Tennessee National Guard, 158th Field Artillery Oklahoma National Guard (both since 2006) and 5th battalion, 3rd Field Artillery, Fort Lewis (since November 2007). The first US Marine Corps battalion equipped with HIMARS, 2nd Battalion, 14th Marine Regiment, was deployed to Iraq in July 2007. In September 2006, the United Arab Emirates requested the foreign military sale (FMS) of 20 HIMARS launchers plus munitions including 101 ATACMS block 1A, 101 ATACMS block 1A Unitary, 104 MLRS, 130 GMLRS and 130 GMLRS unitary rocket pods. The first unit was delivered in late 2009. Lockheed Martin was awarded a further contract in January 2007 for 44 HIMARS systems for the US Army and 16 for the USMC. The US Congress was notified of the proposed sale of 18 HIMARS launchers plus 32 Unitary GMLRS pods and 30 MLRS practice rocket pods to Singapore in September 2007. The first HIMARS launcher was delivered in July 2010. It was commissioned in the Singapore Armed Forces (SAF) fleet in September 2011. A contract for 64 launchers (57 for the US Army and seven for the USMC) was placed in January 2009. HIMARS has been evaluated to be used as a common launch platform for GMLRS and ATACMS munitions. Two advanced medium-range air-to-air missiles (AMRAAM) were successfully fired by the HIMARS launchers in March 2009. In November 2010, BAE Systems signed a $16.3m contract with US Army Tank-Automotive and Armaments Command (TACOM) to supply an additional 44 HIMARS vehicles. The contract is a follow-on to June 2010 award of $24m for 63 HIMARS vehicles and appliqué kits. The US Army placed a $139.6m contract with Lockheed Martin in January 2011 the for 44 combat-proven HIMARS, bringing the total launchers to 375. The 400th HIMARS launcher was received by the US Army in September 2011. In December 2012, the Government of Qatar requested for seven M142 HIMARS launchers with the UFCS including other weapons from the US Government. The UAE requested for 12 HIMARS launchers, 100 M57 ATACMS T2K (Block IA unitary) rockets, 65 M31A1 GMLRS unitary pods from the US in September 2014. Lockheed Martin was awarded a $23.17m contract modification by the US Department of Defence in December 2015 for Life Cycle Launcher Support (LCLS) III on all the HIMARS FCS and launcher modules of the US Army and US Marine Corps. In July 2017, the US Army awarded a $73.8m contract to Lockheed Martin as part of its phase two of the Long Range Precision Fires (LRPF) programme, which includes technology upgrades and risk control for the development of a prototype LRPF missile system that can be launched from M142 HIMARS launchers. Lockheed Martin delivered its first fully built chassis and launcher HIMARS in July 2017. The Government of Romania requested the US Defence Security Cooperation Agency (DSCA) for 54 HIMARS launchers in August 2017. The sale also includes 81 GMLRS M31A1, 81 GMLRS M30A1 alternative warhead, ATACMS) M57 unitary, and other weapons, at an estimated cost of $1.25bn. In August 2018, the US Army awarded a $218m contract to Lockheed Martin for the production of 18 HIMARS launchers and associated hardware, as the part of a FMS contract by the end of December 2020. Lockheed Martin was also awarded a $289m contract by the US Army in September 2018 for the production of 24 HIMARS launchers and associated equipment by July 2020. Lockheed Martin has delivered approximately 500 HIMARS launchers to the US Army and its international customers as of October 2018. HIMARS retains the same self-loading and autonomous features installed on the MLRS. The improved launcher mechanical system (ILMS) upgrade and electronics of the improved fire control system (IFCS), which upgraded MLRS M270 launchers, are also fitted to HIMARS vehicles. Lockheed Martin’s universal fire control system (UFCS), a further evolutionary upgrade of the fire control system, has completed development and qualification. From mid-2008, it is being fitted to full-rate production HIMARS. 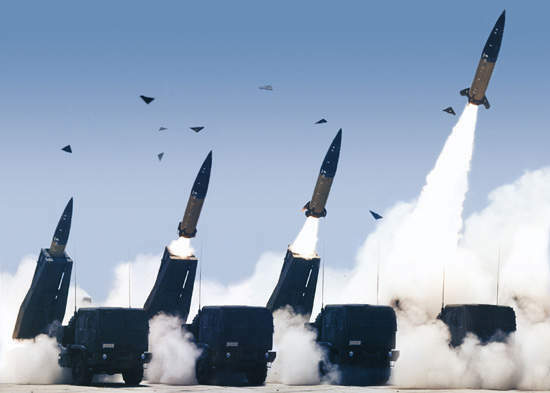 Successful HIMARS test firings of the ATACMS missile (in March 2008) and GMLRS rockets (in May 2008) took place using the new GPS-guided UFCS. The high-mobility artillery rocket system is operated by a crew of three: the driver, gunner and section chief. However, the computer-based fire control system enables a crew of two or even a single soldier to load and unload the system. The fire control system includes video, keyboard control, a gigabyte of programme storage and global positioning system (GPS). The fire control computer allows firing missions to be carried out in automatic or manual mode. In a typical mission, a command and control post would transmit the selected target data via a secure data link to the HIMARS on-board launch computer. 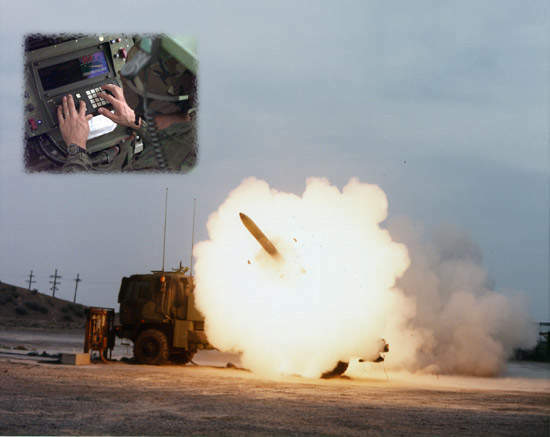 The computer then aims the launcher and provides prompt signals to the crew to arm and fire a pre-selected number of rounds. The launcher can aim at a target in just 16 seconds. It is possible for the crew to select pre-programmed multiple mission sequences which have been stored in the computer. In addition to the standard MLRS round, HIMARS is capable of launching the entire MLRS family of munitions, including the extended-range rocket, the reduced-range practice rocket and all future variants. The high-mobility artillery rocket system carries a single six-pack of MLRS rockets, or one army tactical missile system (ATACMS) missile. The extended-range MLRS rocket (ER-MLRS) improves the basic M26 range of 32km to more than 45km and the area of influence by 107%. Extension of the rocket motor has resulted in a reduction in the payload to 518 M85 grenades, but the dispersion of the grenades is improved for better effectiveness with fewer grenades. 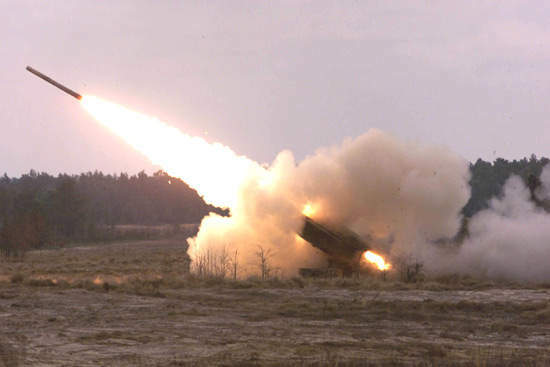 In April 2004, HIMARS successfully test fired the new extended range guided rocket GMLRS, with a range of more than 70km. The Lockheed Martin GMLRS rocket has a GPS, an inertial guidance package and small canards on the rocket nose to enhance accuracy. 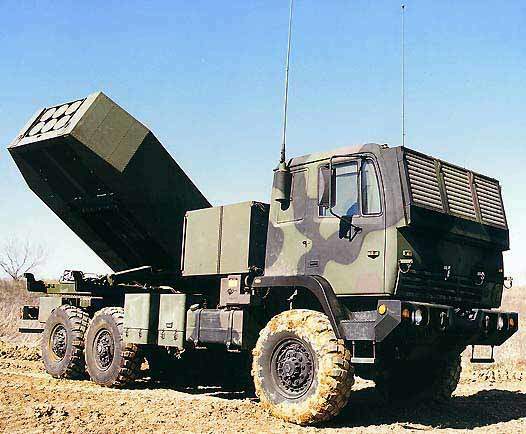 GMLRS completed System Development and Demonstration (SDD) tests in December 2002 and entered low-rate initial production in April 2003. Initial operating capability (IOC) was achieved in 2006, but the system has been operationally deployed since September 2005 in Iraq. The GMLRS is an international programme involving the UK, Italy, France and Germany, as well as the US. The industrial team includes Diehl, MBDA and FiatAvio. In May 2005, the first deliveries were made of a unitary variant of GMLRS, developed by General Dynamics Ordnance and Tactical Systems, with a single 81.6kg (180lb) warhead and a range of up to 70km. In October 2003, Lockheed Martin was awarded an SDD contract for 86 unitary variant rockets, which were delivered in June 2005. In June 2007, GMLRS Unitary entered low-rate initial production (LRIP). HIMARS is capable of firing the long-range ATACMS (army tactical missile system) guided missile. The ATACMS family includes the Block I, Block IA and Block IA Unitary missiles. The Block I missile delivers 950 anti-personnel anti-material (AP/AM) baseball-sized M74 submunitions to ranges exceeding 165km. The Block IA missile range exceeds 300km by reducing the submunition payload to 300 bomblets and adding GPS guidance. The missile, with a single-burst warhead, was first deployed in support of Operation Iraqi Freedom in March/April 2003. The programme to develop the Block II missile with GPS and 13 BAT (brilliant anti-tank) submissiles and the Block IIA missile with six improved BAT submissiles was cancelled in February 2003. The high-mobility artillery rocket system carries a single six-pack of rockets on the army’s family of medium tactical vehicles (FMTV) 6×6 all-wheel drive 5t truck supplied by Armor Holdings Tactical Vehicle Systems Division (now BAE Systems Mobility & Protection Systems) in Texas. The vehicle weighs approximately 24,000lb (10,886kg) compared to more than 44,000lb (19,958kg) for the MLRS M270 launcher. HIMARS is transportable on the C-130 aircraft, allowing the system to be moved into areas previously inaccessible to the larger C-141 and C-5 aircraft required for the M270 launch vehicle.